Home » Uncategorized » Our New Office! Shoeboxed has moved! Our new offices are just a couple of blocks down the same street in downtown Durham, North Carolina. 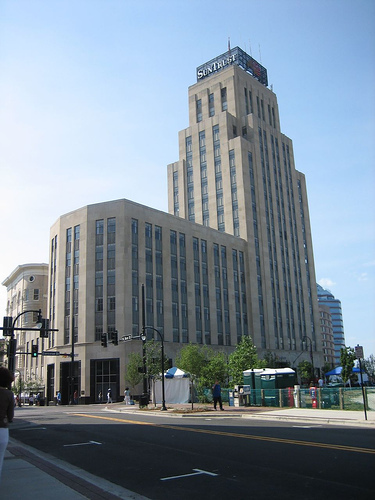 We’re excited about the move, as we have a great new colorful space in the Suntrust building, one of the tallest and most recognizable buildings in Durham. We needed to move into a more functional space, and we are much happier with the layout and size of our new office. It will allow us to more efficiently and effectively serve you as we keep growing. For all our Durham fans who know the area, we’re just down Main Street further into downtown. We are right next to the amazing American Tobacco Complex and the Durham Bulls Athletic Park, not to mention Locopops, a local favorite. So are there any implications for you with this address change? Well, there are a couple of things probably worth noting, but nothing to stress about. There is no need to worry about your receipts getting to us as a result of our move. Shoeboxed intercepts mail from the United States Postal Service before the carrier level to ensure the security and speed of our service. This means that once your receipts arrive in Durham, we collect them, and do not wait for them to be delivered to us. Because of this special relationship with USPS, the exact address on your envelopes does not matter all that much. For Receipt Mail-In Classic and Receipt Mail-In Express members, you can still use your bright blue envelopes even though the address is old. They will still come to us. For Receipt Mail-In Basic members, you can use the new address since you have to address your envelopes yourself anyway. Don’t stress if you accidentally use the old address though; your receipts will still come to us. Let us know if you have any questions, and feel free to stop by if you are from the area! Congrats on the new space, guys! It’s great to see that Shoeboxed is growing. Meet Our New VP of Marketing, Corey!